Yamaha Arius YDP-V240 Review - Is this piano any good? Yamaha describes the Arius YDP-V240 as an ‘entry level’ digital piano. If you are looking for a piano to take on tour, this may not be the best option, but it is great for beginners. The YDP-V240 has excellent connectivity to other devices. You can also play this with multiple effects and a full set of pedals for control over the sound. The sampling also helps with the dynamics of you performances, and lets you hit the keys harder or softer for different samples. You have a full range of sounds to play at multiple velocities just like you would on an acoustic piano. The piano sounds are good quality and more than good enough for a beginner to find an appropriate sound to learn with. You have an impressive number of sounds included. 131 built-in sounds are combined with 361 XGlite and then 12 Drum and sound effect kits. These special effects kits are a fun feature. The Yamaha YDP-V240 has more sounds than many keyboards. Many digital pianos only have 10 or so inbuilt sounds. The multi-velocity samples relate to the ‘hammer action’ of the piano. You can play multiple velocities relating to how hard you play. The piano senses how hard you have pressed a key and will alter which sample it plays as a result. Hammer action replicates the tiny hammers within an acoustic piano. Tiny hammers were originally used on grand pianos to play the notes, and the Yamaha Arius YDP-V240 is exactly the same in terms of how it feels. The Arius feels good for a digital piano. Many of the more modern products in Yamaha’s range have a simulated ebony and ivory feeling, but this model does not. You may not notice any difference, especially if you haven’t played an acoustic piano much. The ebony and ivory function also comes at an extra cost. You will also feel that higher notes are more responsive when playing more lightly, and notes lower on the keyboard require firmer playing. Yamaha has included this feature to further simulate the feel of an acoustic option. You can actually choose the sensitivity of the keys yourself. Select the hard, medium or soft setting and work out which is most suitable for your own style and the strength of your fingers. You can also turn it off when playing organ for a full sound. Beginners love this piano. The manufacturers probably call it ‘entry level’ because it is so good for people new to the hobby. Performance assisted technology is included with this piano. This means you can play perfectly each time. The keyboard can be played on any key and is an exercise to keep in time with music rather than worrying too much about which notes to play. You will get the Yamaha Education System included with your piano too. You can learn quickly and easily with inbuilt lessons. Lessons are broken down into the left-hand and right-hand actions so you can learn one step at a time. It also has an LED screen. You can easily learn from the data which shows on this display when a song is playing. Digital MIDI and song files can include chord data and notation. This can help you learn to read music, but this is optional. Learners can use the Easy Song Arranger to select a style to load a song in. A song that is ordinarily played as a ballad, for instance, can be turned into another style such as Bossanova jazz. These different arrangements help learners to learn more about how to play piano. 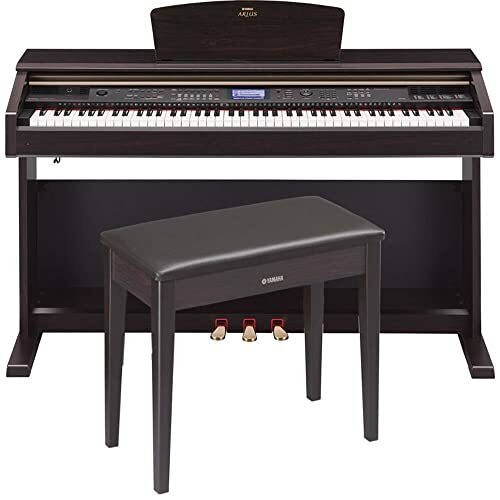 All-in-all the Yamaha Arius YDP-V240 is a great beginner’s digital piano. The Arius YDP-V240 has the added bonus of built-in effects. You can use reverb, distortion and other dynamic effects which give further control of the sound and its characteristics. Reverb can help simulate the sound of playing in multiple different spaces and give an ambiance to the sound. The Yamaha Arius has an impressive sound system. It is clear and high in power, with two 20W speakers making an overall 40W of speaker power. This is more than many home guitar amps, and more than enough for home practice. You will only really need to plug this in if you plan to play into a PA system. 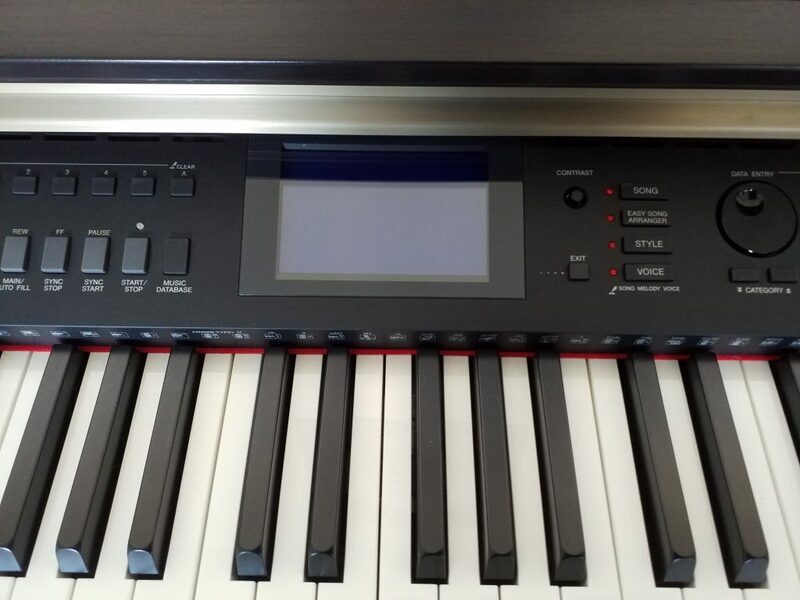 Being able to connect your digital piano to other devices is one of the many benefits of digital piano over an acoustic model. This piano can both read and write audio files. You can load MIDI files from a USB storage device, to allow you to learn virtually any mainstream song you want to. The multi-track recorder also means that you can record your ideas onto a USB stick so you can listen to what you have been playing. If you are new to piano, listening back to recordings of your practicing can help you to work out what areas to improve. You can also connect via USB to a computer to control virtual instruments and synthesizers. If you are looking for a Yamaha digital piano for beginners, this is a great option. You can use the LED system to learn chords or even how to read music. The sound system is great, with plenty of clarity and quality for private practice, or you can plug in up to two headphones if required. Although there are pianos which feel more professional in the range, with slightly better sampled sounds, this is a good starting point. The YDP-V240 offers great value for money and features to let you learn quickly and effectively. Alesis Recital Review – Is It Worth The Investment?